Players from six continents and assorted islands will gather at the Montien Riverside Hotel in Bangkok for this year’s World Amateur Go Championship June 7-10. 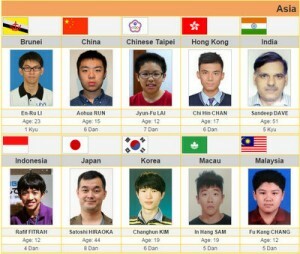 The Asian contingent will be young, including 12-year-old contestants from Chinese Taipei, Indonesia, and Malaysia and teenagers from China, Hong Kong, Korea, Macau, Singapore, and host country Thailand. Japan will field a two-time former world champion, and Europe will field several players who have placed high in past years. Danny Ko represents the US and Juyong Koh is playing for Canada. Click here for video self-introductions by sixteen of the fifty-eight players. Click here for the list of players and the event schedule. The events main sponsors are CP All, The Siam Commercial Bank, and Red Bull. Seven games each round will be broadcast on Pandanet. Ranka Online will carry reports of the entire event.